Sometimes, fishing is not about catching huge fish or even fish big enough for the table. It’s about fishing and catching the smaller stuff, but still getting the same amount of joy and excitement from the hobby. For my husband Rich and I, fishing is also about getting outdoors, enjoying nature, the sea, good company and conversations putting the world to rights. 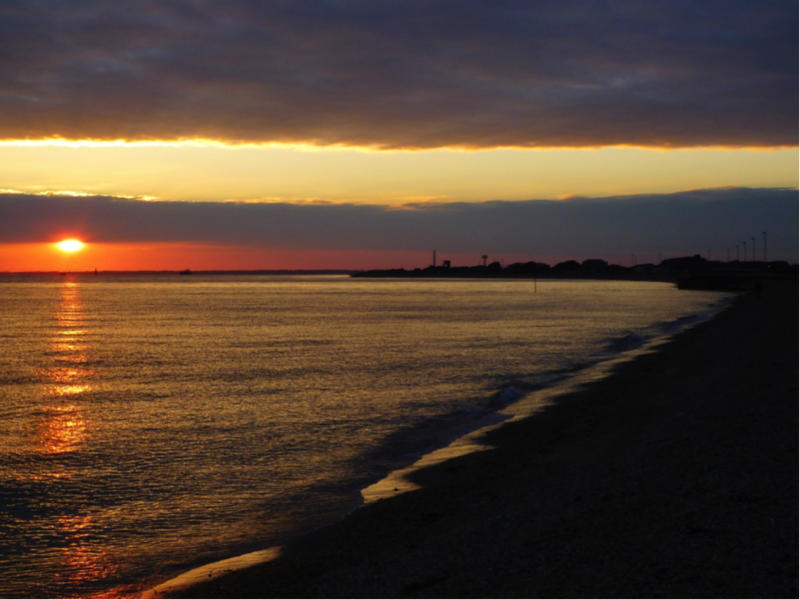 On sessions like these, every fish caught is a pleasurable bonus to a lovely evening. I, for one, will never get sick of catching ‘the little stuff’. It’s not everyone’s thing, but it still puts a smile on our faces and we are more than happy with that. 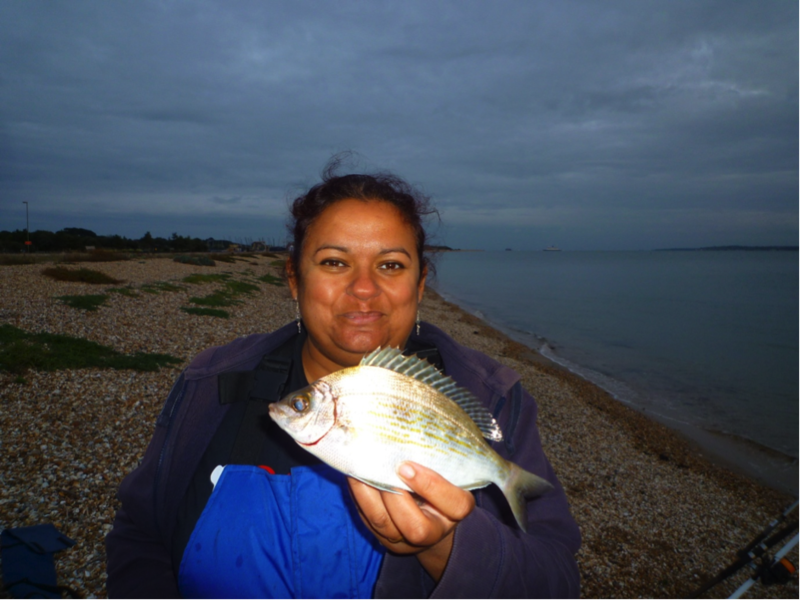 My husband Rich and I have fished Stokes Bay in Gosport three times in the past fortnight. 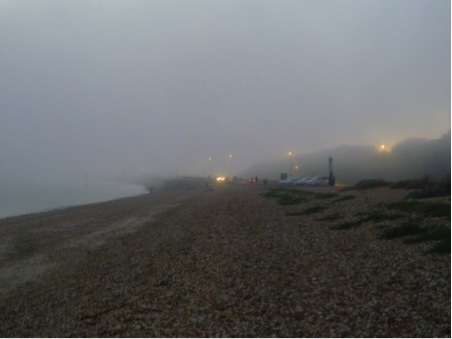 Conditions have been calm and relatively weed free, fishing over sunset and into the night, usually starting about two hours before high tide and fishing about one hour into the ebb. A father with his children came over and spoke to us and was initially disbelieving when we told him a member of the shark family swims in these waters, that is until we showed him the photos! The children were fascinated, hopefully some future anglers in the making there. 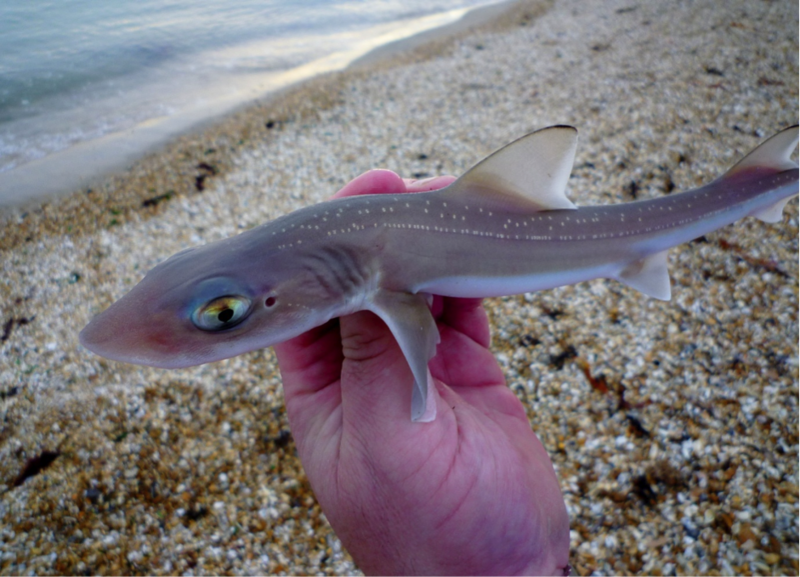 It would have been nice to catch this little smoothound’s older brother or sister, but we only had ragworm and mackerel baits with us. Still, the pups were quite happy taking our baits and we were quite happy catching fish. Our second session saw more of the same action, with some tiny whiting thrown in too. Rich was making a determined comeback in our fishing competition, narrowing the gap fish by fish, he was working hard to catch up with me. Our third session saw the gap at just three fish between us, the closest it has been all year. It was another calm evening with a stunning sunset. Rich was into fish from the start, with a smoothound pup. I evened the gap quickly though with a tiny whiting the size of my palm. 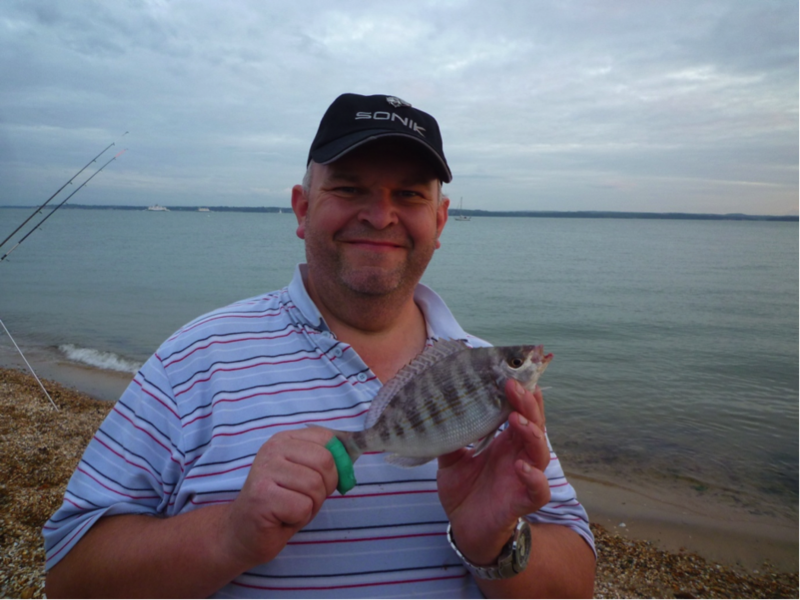 Then Rich had a good bite register on his rod, and wound in this lovely black bream, his first of the year. As dusk turned to night our fish scores were staying level, with a couple more smoothound pups and tiny whiting. Then Rich shouted over that he had another fish on and he sounded rather surprised at his catch. 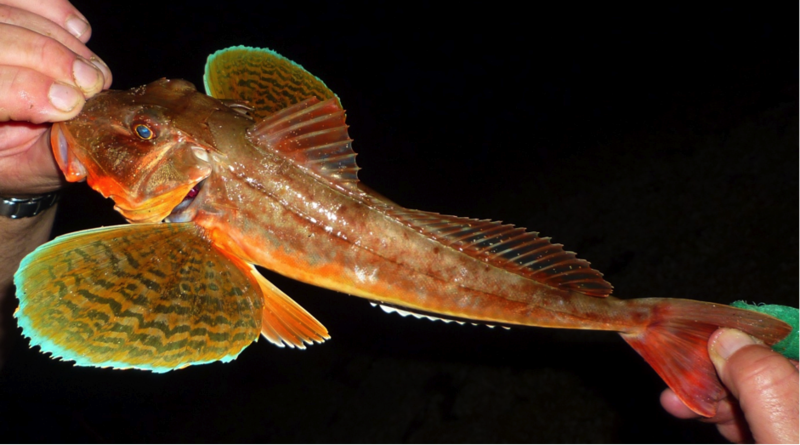 It was turning out to be an evening of firsts, as Rich held up this beautiful tub gurnard, again his first one this year. We think they are stunning fish, just look at the amazing turquoise colours on its pectoral fins, very tropical-looking. I had never seen one close up, and it didn’t go unnoticed that they may be beautifully coloured but they do have a very spiny dorsal fin and sharp spines protruding from the head and above the eyes. Handle with care! After the excitement of getting such a mixed bag of fish, we totted up our fishing scores and realised that Rich had made a bit of a comeback, bringing it to just one fish between us, another first. The scores are now 111 to 110 fish for the year. I’m leading, but Rich is catching back up fast. Will he be able to overtake my score and come out the leader for the first time this year?